I have been making some men's scented soaps for my son for Christmas because he's finally decided that body wash is not kind to his skin. This is one of the first I made for him. I was thrilled by how easy it was to create a decorative touch by simply layering a bit of powdered cinnamon between pouring layers of the soap. I like to think is reminiscent of the hiking trails local to the Blue Ridge Mountains of Virginia where I reside. And the scent? Well, it's equally amazing. I scented this masculine soap with a blend of Oakmoss, Sandalwood, Tonka Bean, Cedarwood, Lemon, and Petigrain. I decided to name this one Fragrant Woods. I also used the same layering technique with these soaps. This one is eucalyptus and tea tree. I layered it with fine ground, green colored loofah. And this one is scented with cedarwood and sage essential oils. I layered it with ground apricot kernel meal. I've just unmolded and cut two new handmade shea butter soaps - Citrus Cilantro Shea Butter Soap and Vanilla Bean & Clove Shea Butter Soap. My handmade Citrus Cilantro Scented Shea Butter Soap is a fresh, clean smelling blend of Lemon, Cilantro, Cut Grass, and Green Tea. It is colored a decorative yellow and green and contains bits of loofah for light exfoliation. My handmade Vanilla Bean & Clove Scented Shea Butter Soap - which will turn a solid dark brown once it cures - smells like crushed vanilla beans enhanced by clove & cinnamon on a dry down of musk. My newest soap I just unmolded. 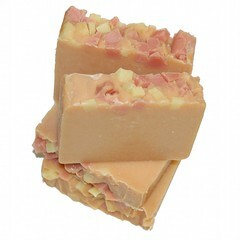 This moisture rich shea butter soap is handmade specifically for those with normal to dry skin. 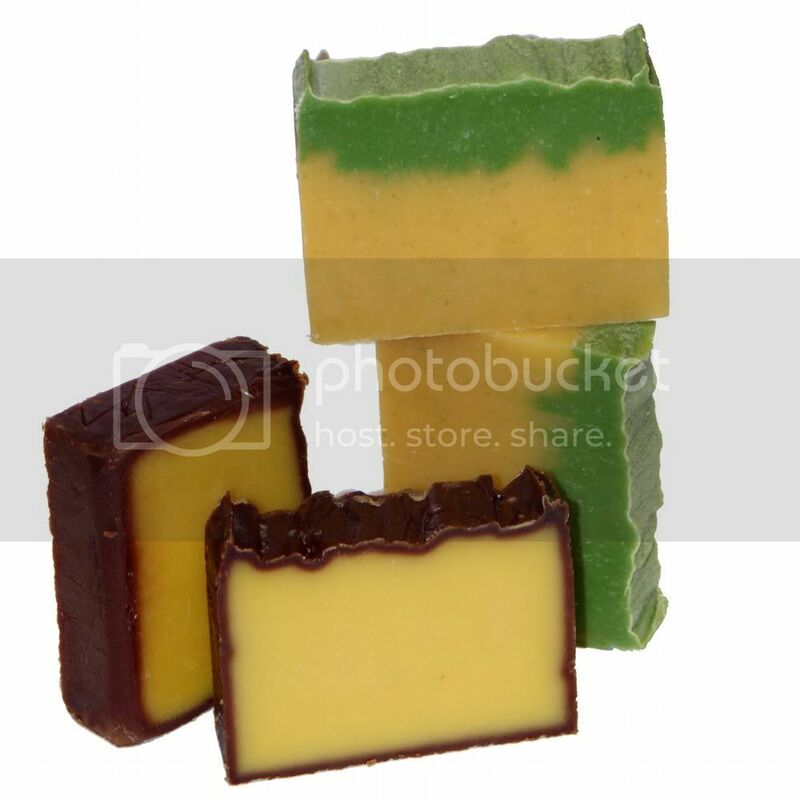 The scent of this soap is a fruity blend of ripened mango and juicy papaya. It contains shea butter, cocoa butter, olive oil, rice bran oil and other skin loving ingredients. I used yellow oxide and red oxide pigments for the orange color and added soaps bits from my last several batches of soap for visual interest. The red is from my Red Currant Soap and the yellow from my Lemon Mint Soap. I like the way it turned out. I sold an all natural foot cream down on the Roanoke City Market for years. It was highly popular year round, but I could only sell it during late fall to early spring because it would melt during the summer while I was vending outside. Since I have decided to no longer produce this product despite its popularity, I figured I would pass the recipe on to my faithful readers. It's rather easy to make and yields about 2lbs. of product. You can divide this up into eight 4oz. jars or four 8oz. jars and keep them stored in the refrigerator for longevity or gift the extras. Or, simply halve the recipe to make less. 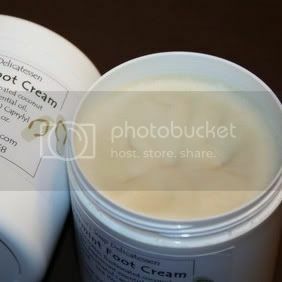 My Peppermint Foot Cream is comprised mainly of natural shea butter. It's a great, all natural moisturizer with peppermint oil to refresh your feet and anti-fungal tea tree oil to keep your tootsies in tip top shape. You'll want to weigh all of your ingredients using an accurate scale. Melt the cocoa butter and shea butter together in a pot on the stove or in the microwave. Once melted, stir in your fractionated coconut oil, peppermint essential oil - I use triple distilled Japanese peppermint oil because it has more of a peppermint candy smell than a medicinal smell, tea tree oil, and liquipar if using a preservative. Mix well with a spoon, then pour into your final containers. Screw on the lid and set in the fridge to cool until hardened.